Soul legend Aretha Franklin says she plans to retire from music to spend more time with her grandchildren. The 74-year-old said she would record one final album with Stevie Wonder before stepping out of the limelight. “I must tell you, I am retiring this year,” the Queen Of Soul told a Detroit TV station, adding that she felt “exuberant” about her plans. One of the most distinctive voices in popular music, she is known for hits including Respect and Dr Feelgood. 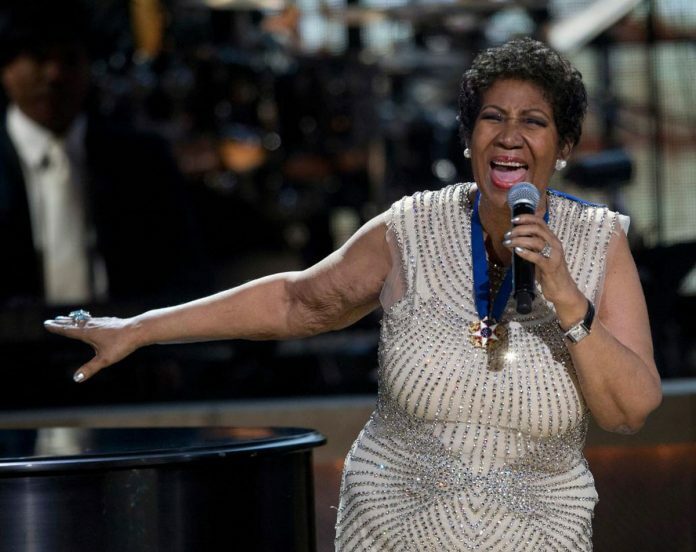 Franklin has been performing since she was 19, but has been suffering from ill health in recent years. In 2010, she had to put her career on hold following abdominal surgery and has since slowed down her once-prolific tour schedule. Looking back on her success, the star said: “I feel very enriched and satisfied with respect to where my career came from and where it is now”. There is a caveat to her retirement plans: The singer said she would remain open to “some select things, many one a month, for six months out of the year”. Born in Memphis to a famous Baptist preacher, Franklin was tutored from an early age by gospel stars like Mahalia Jackson and Clara Ward. A move to Atlantic Records in 1966 turned things around. Producer Jerry Wexler paired her with the famed Muscle Shoals Rhythm Section, who prompted some of her most soulful, fiery performances. By 1968, she was renowned throughout America and Europe as “Lady Soul” – a symbol of black pride, who was presented an award by Martin Luther King, and appeared on the cover of Time. Although she faltered in the era of disco, an appearance in cult comedy The Blues Brothers brought her back into the public eye and she scored a number of big hits in the 1980s, including Who’s Zooming Who? and the George Michael duet, I Knew You Were Waiting (For Me). She has continued to record and perform since, and two years ago, the star reduced President Obama to tears when she performed (You Make Me Feel Like) A Natural Woman at the Kennedy Center Honours ceremony.